We are a small rescue group that spends our donation money on vet bills, dog food and any and all items for the dogs. We hope that you will be a part of helping the Jack Russell Terriers that are on their way to their forever homes or to help those that we are helping heal before they move on to their lucky future. You can submit a one-time donation, become a rescue sponsor or donate a toy. Jacks Galore does not take dogs in waiting to be adopted because we do not have enough space to accommodate dogs long term. 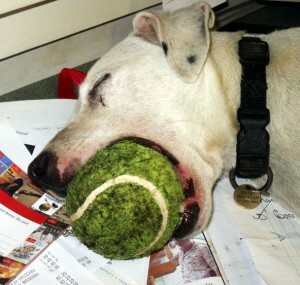 We work with the dogs being adopted and have them come via Jacks Galore on their way to their new forever homes. We also have some unadoptable lifers that need the accommodations for a comfortable and fulfilling life with us as forever JRTs. 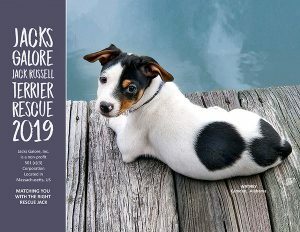 Our annual calendars raise funds for the care and adoption of Jack Russell Terriers. Monthly donations are a great way to help us do even more to save lives and find forever homes for our terriers. As a Jacks Galore sponsor, you’ll make a difference by providing steady income that we can count on to do our work of providing shelter, food, veterinary care, love and protection. When you sign up to be a Jacks Galore sponsor, your contributions will be charged automatically via PayPal on an ongoing basis (once a month for 12 months). Your sponsorship donations are tax deductible. Each sponsorship subscription lasts 12 months (i.e., $10 sponsorship = $10 x 12 months = $120 total). We offer four sponsorship levels: Bronze – $10, Silver – $25, Gold – $50 and Platinum – $100. All donations are tax deductible and you will receive a receipt for your support. If you feel so inclined we can always use toys, balls, chews and treats for the dogs if you feel like helping our jacks in need and those being cared for by Jacks Galore.